The Schoolsky Apple-1 computer in the Bugbook Collection. 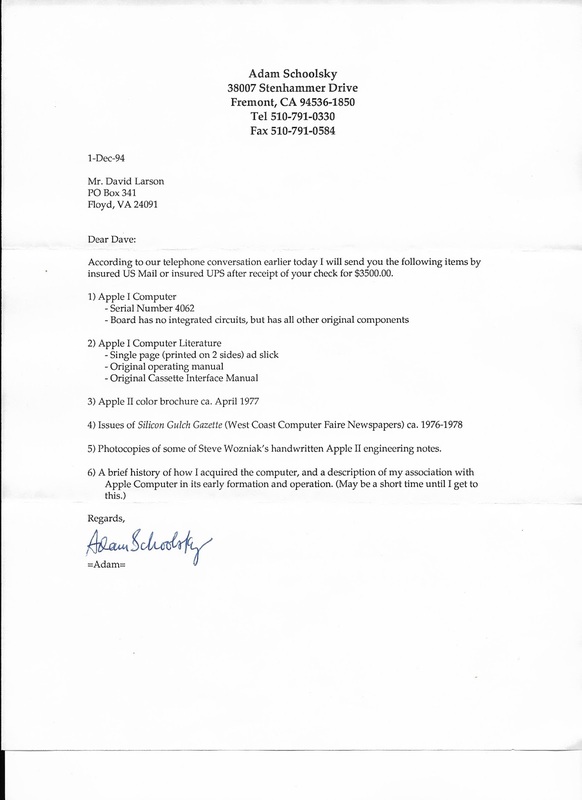 I purchase this Apple-1 computer in 1994 from Mr. Schoolsky who was a young friend of Steve Woznick during the start up of Apple. 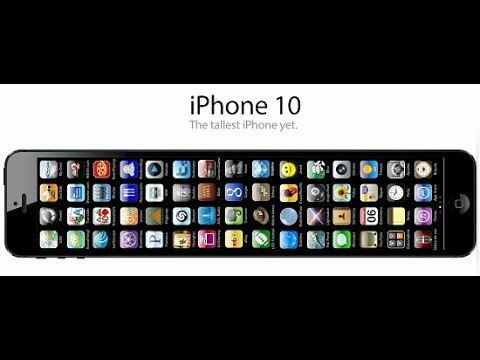 If he would have accepted the job offer he would have been the 6th Apple employee. Woznick gave this Apple-1 to Schoolsky during time when the Apple-1 was being sold in 1976. This computer has been made fully functional by my friend Win Heagy. This is the second Apple-1 Win has restored for me. 1. Original letter ( 12/1/94)to me from Adam Schoolsky with signature. Adam was the first owner and I am the second owner. I also have the envelope with the letter. 2. Envelope from Adam Schoolsky 1994. 2. Original hand written letter from Adam Schoolsky with signature to me about getting the literature and Apple-1 ready for shipping to me. 3. #58 on the Willegal Apple-1 registry. 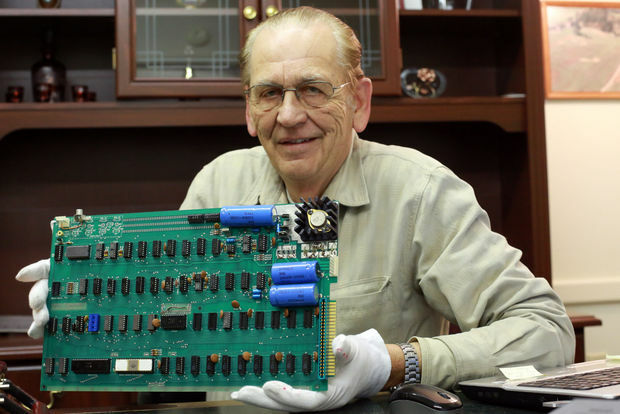 Mike Willegal for many years has been keeping track of all the known Apple-1 computers. All four of the ones I owned are on the registry and the Schoolsky computer is here http://www.willegal.net/appleii/apple1-originals.htm#Schoolsky you can see the site by clicking on the link. 3. 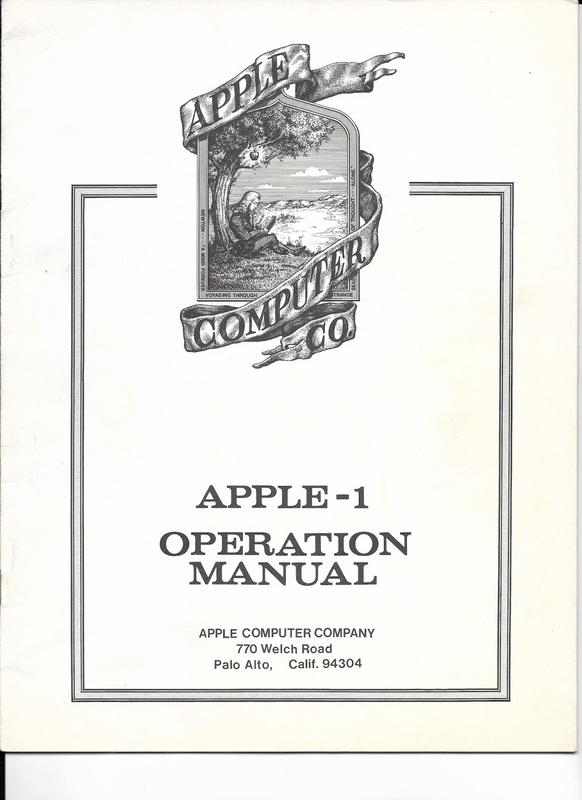 Original Apple-1 14 page operation manual - mint condition. 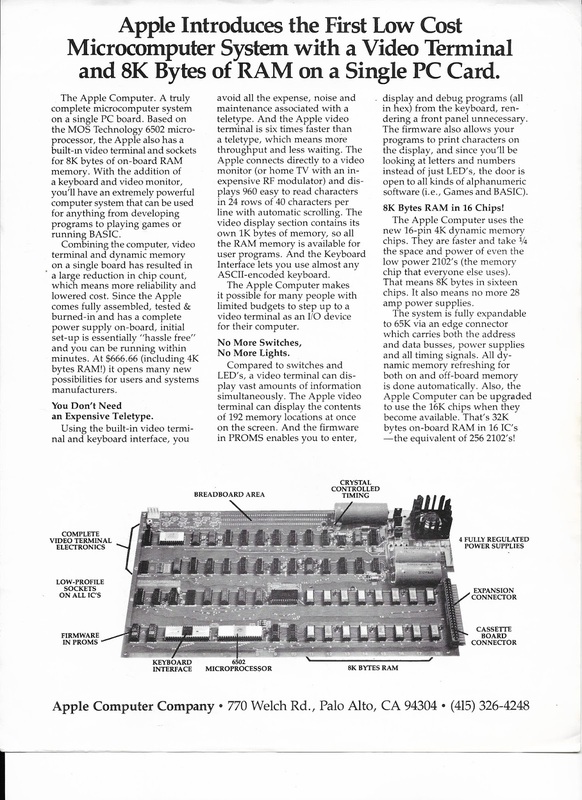 One Page from the Apple-1 Operations Manual. 4. Front side of original Apple-1 computer advertising slick - 2 sided mint condition. Adam acquired this while helping Steve Wozniak during the first few months of the Apple Company start up. Adam would have been employee #6 if he had accepted the job offer to work full time at Apple. 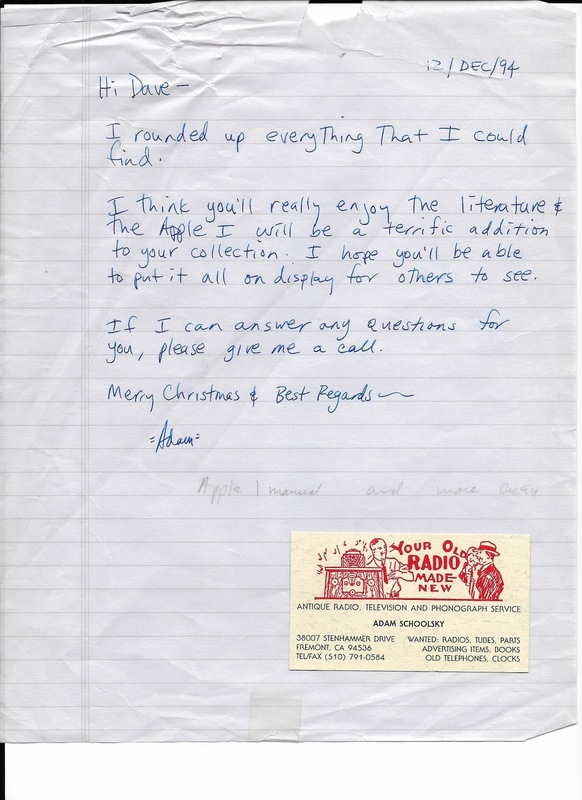 This is shows a note from Adam on the outside of the clear envelope containing the Apple-1 ad slick. I have the original white box that all the Apple-1 computers were packaged in. This box has the name Woz ( The name Steve Wozinak uses) written on it. 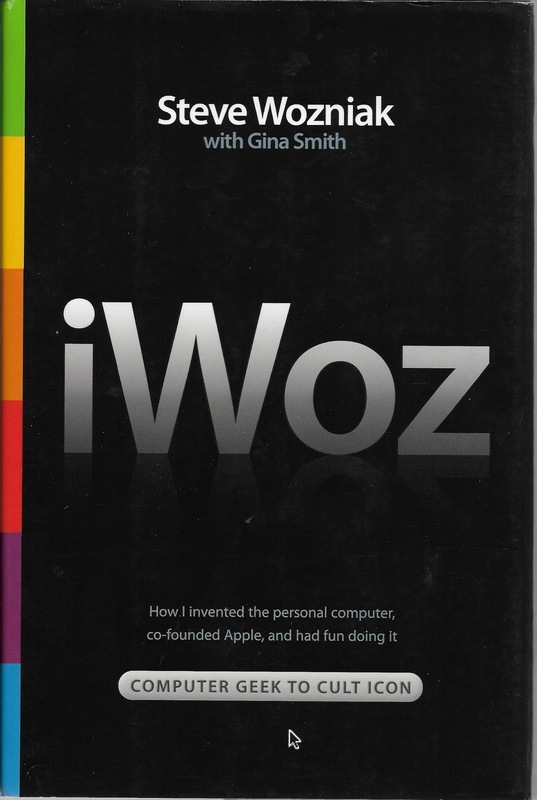 Closer look at Woz written on the Apple-1 box cover. 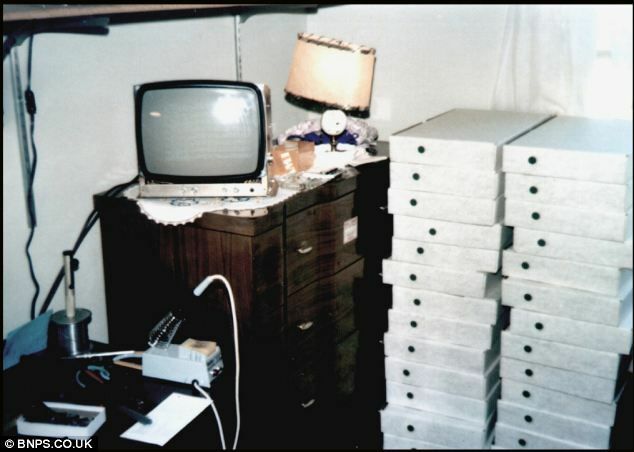 Apple-1 computers stacked in boxes in Steve Jobs' bedroom from the very earliest Apple-1 computers. This photo shows the boxes used for the Apple-1 computers and is the same as the box I have. Adam Schoolsky sent me the Apple -1 computer in this box and said it was an original. The writing on the box also is a good indication of an original box. 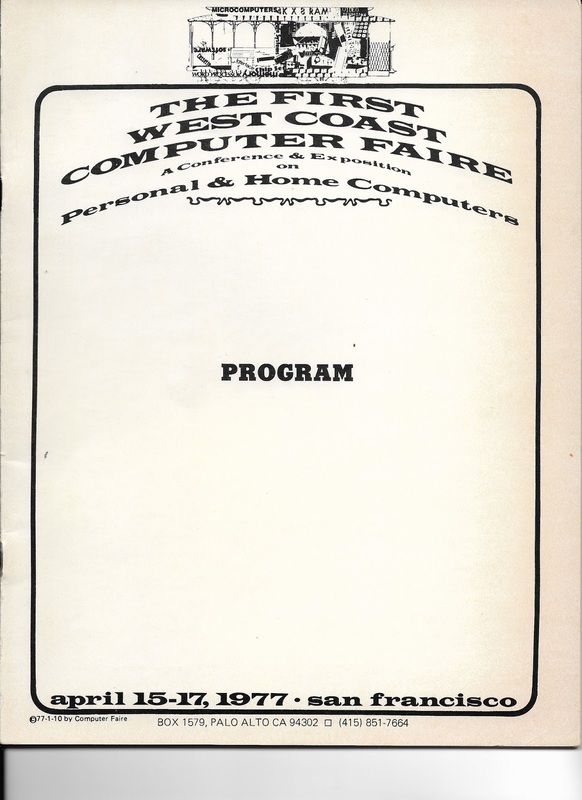 An original 40 page program listing from the first West Coast Computer Faire in California. The Apple Computer Company was selling the Apple-1 computer at this faire. Adam Schoolsky was also at this show helping the owners Steve Wozniak and Steve Jobs. This is also the Faire where Wozniak and Adam Schoolsky did the Wozniak joke/spoof of putting out a brochure of a computer that was better than all the competition but did not exist. This spoof computer was called the "Zaltair" and now this is referred to as the "Zaltair Store". 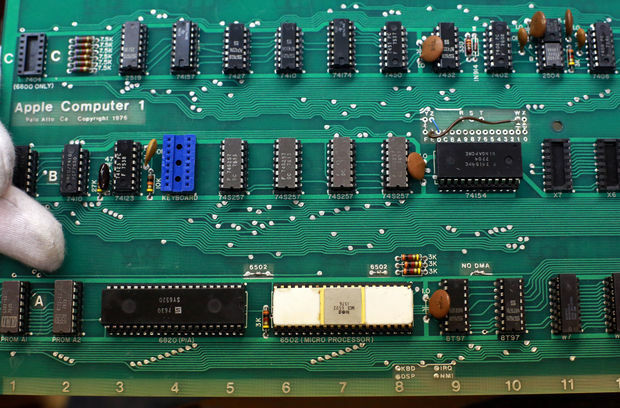 See PDF view of this entire West Coast Computer Faire program. 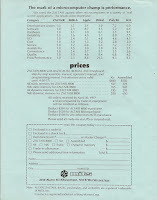 Back cover of the original 40 page program listing from the first West Coast Computer Faire in California. 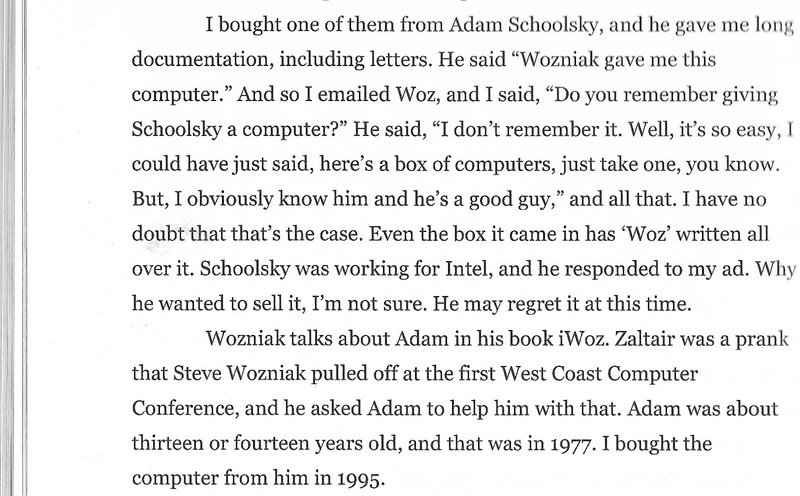 Wozniak is a like to pull pranks on people and at this Computer Fair he had Adam Schoolsky help with what is known as the Zaltair prank. The prank worked this way -- a nice 2 sided brochure of a none existence computer ( Zaltair) was made up by Woz and Adam & 10,000 were printed. 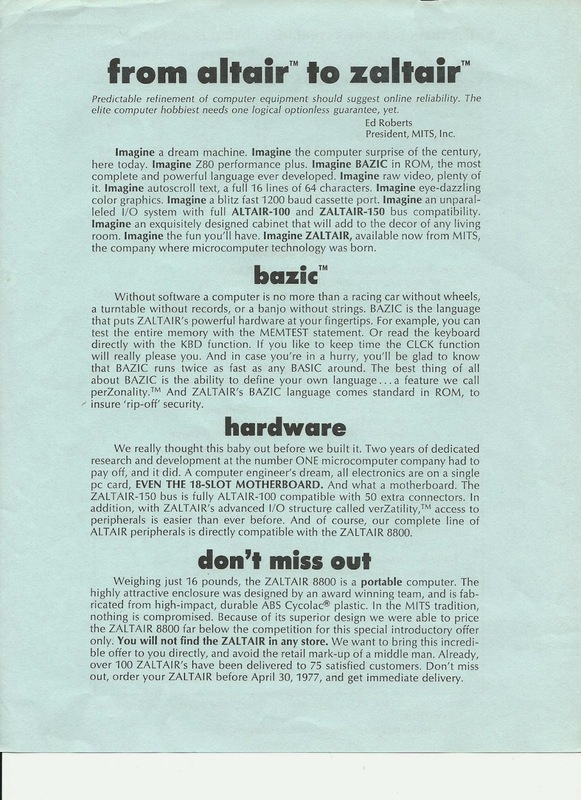 The Zaltair Computer had a better price and specifications then all the current microcomputers on the market. This caused a big commotion at the Faire and it was done in secret so no one new who had created the brochure. 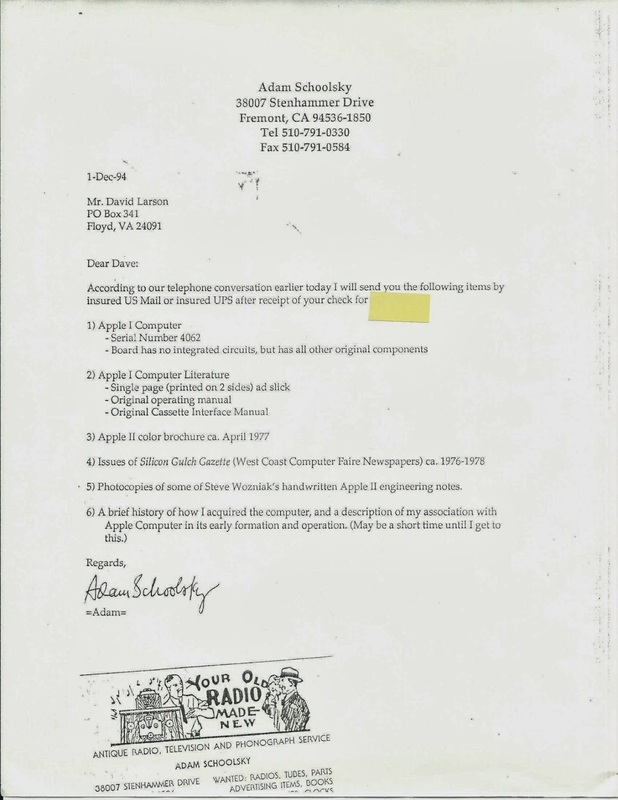 It was years later that Wozniak told Steve Jobs that he and Adam did the Zaltair hoax. I have a lot of detail about the story of the Zaltair hoax in my blog. 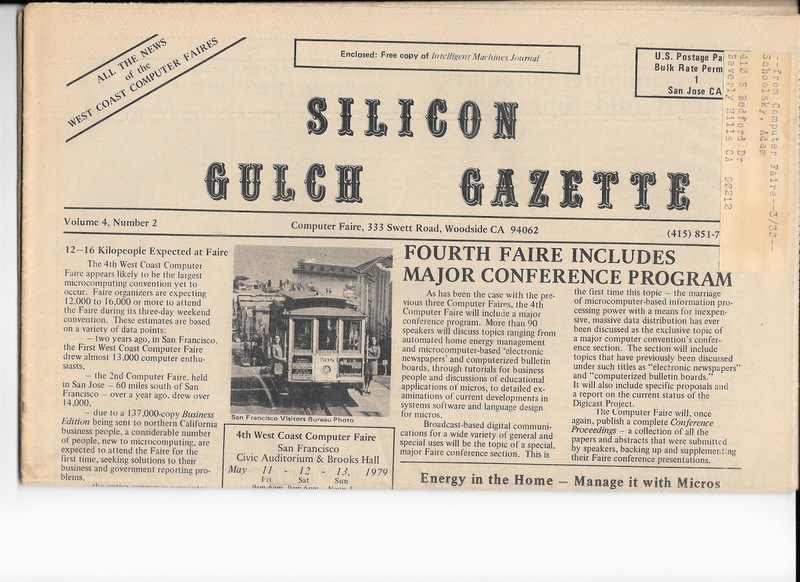 Read the Zaltair story here "CLICK"
An original copy of the very first Silicon Gulch Gazette - volume 0 number 1. 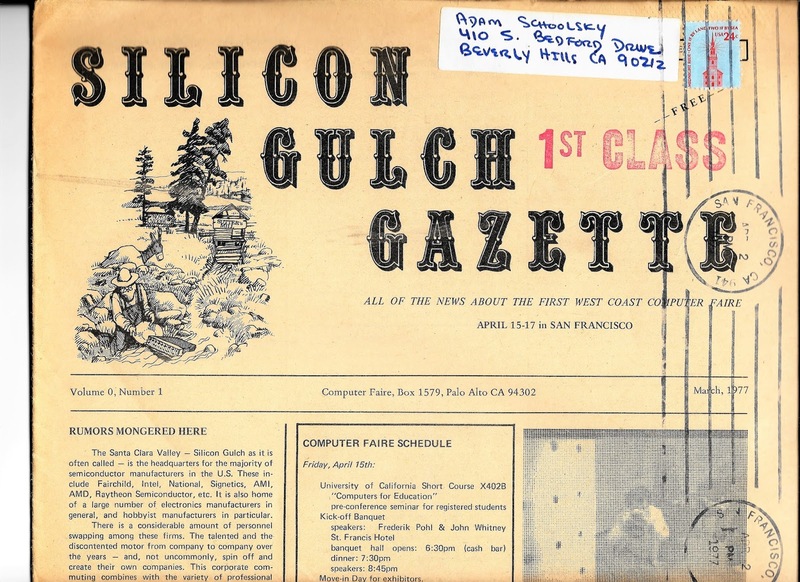 The Silicon Gulch Gazette was published to promote the West Coast Computer Faire. It is interesting that the label was hand written with Adam Schoolskys mailing address. at the First West Coast Computer Faire. This first edition also has a loose leaf insert inviting people to be speakers or exibitors at the First West Coast Computer Faire. An original copy of the Silicon Gulch Gazette Volume 4 number 2 addressed to Adam Schoolsky. An original copy of the Silicon Gulch Gazette Volume 3 number 3 addressed to Adam Schoolsky. Also an interview with me and I also discussed the purchase of this computer. The pages and text of these interview are listed below. Page 250 from Bob Luthers book "The First Apple-1"
This is about me discussing the purchase of Adam Schoolskys Apple-1 computer. 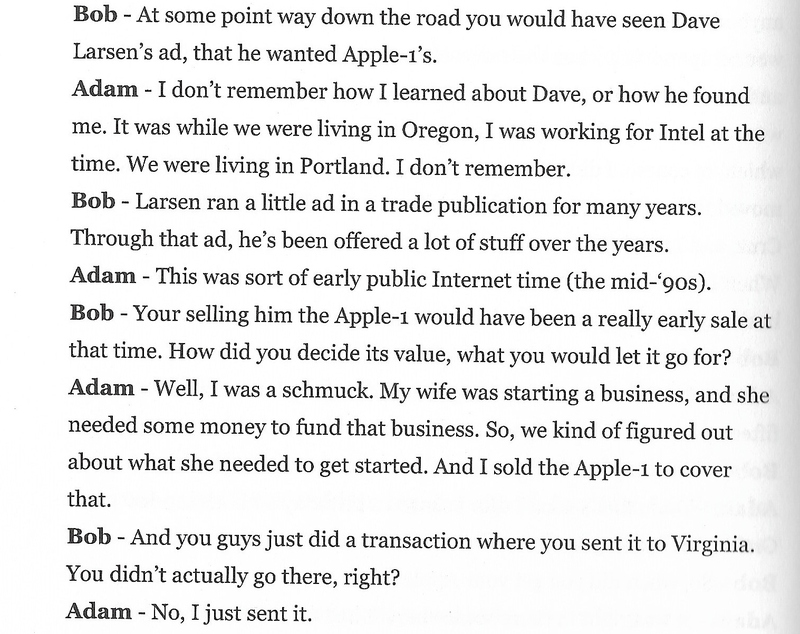 Page 256 from Bob Luthers book "The First Apple-1"
Adam Schoolsky had the opportunity to be the sixth Apple employee. Page 266 from Bob Luthers book "The First Apple-1"
Adam Schoolsky discusses the sale of this Apple-1 computer to David Larsen. Steve Wozniak's book 2006 "iWoz"
Steve Wozniak's book 2006 "iWoz" . Wozniak talks about the Apple-1 computer however I want to show how he worked with Adam Schoolsky in the very early days of the Apple Company. 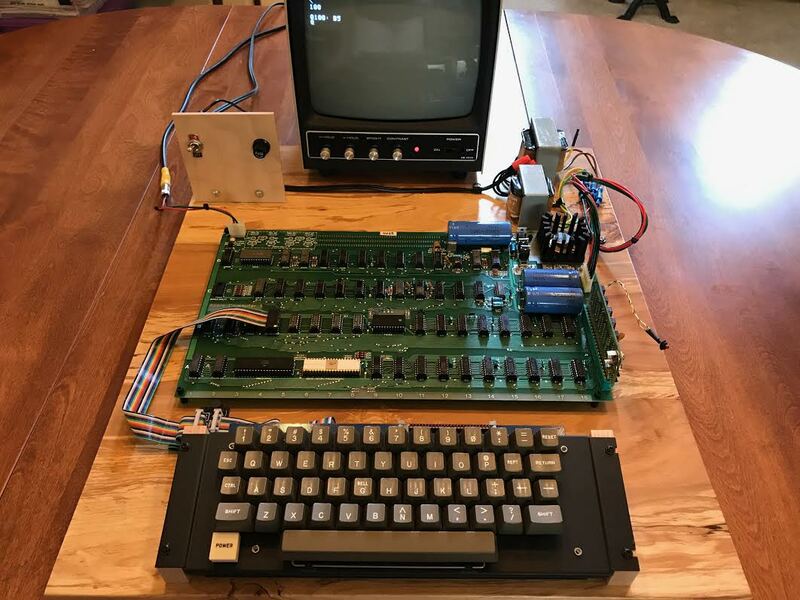 The Apple-1 computer that I purchased from Adam Schoolsky is a result Adam being a friend and working with Steve Wozniak at the First West Coast Computer Faire in 1977. 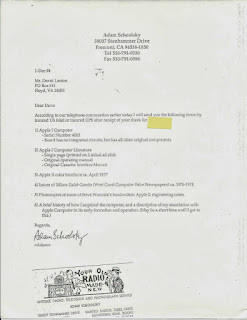 One of there projects was the Zaltair computer hoax that Wozniak and Schoolsky pulled off at this faire. The excerpt of the Zaltair story is in the next two slides. Page 202 from the iWoz book shown above. Wozniak talks about being at the first West Coast Computer Faire in 1977 and wanting to so put out some fake news or computer hoax. 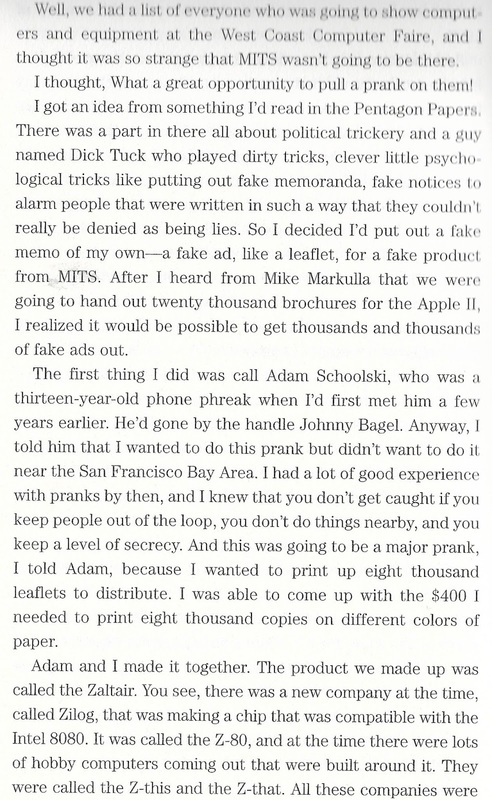 He also talks about how he and Adam Schoolsky printed 8000 copies then secretly distributed them. Steve tells how he decided to make the fake computer brochure with various computer comparisons with the fake Zaltair computer. He then directed the brochure to the Altair compute made by Ed Roberts. Of course Ed Robers was highly upset with this fake brochure. Who and how this hoax was done was kept secret for several years. 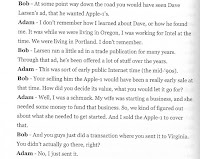 Several years latter Wozniak did tell his partner Steve Jobs that he and Adam did the Zaltair hoax. 30 ton Vintage Computer collection moves to the "Computer Museum of America". It was a 45 years effort and a great hobby to build my "Bugbook Historical Microcomputer" collection. In February of this year (2016) it was all packed up and sent to the Computer Museum of America in Roswell, Georgia. 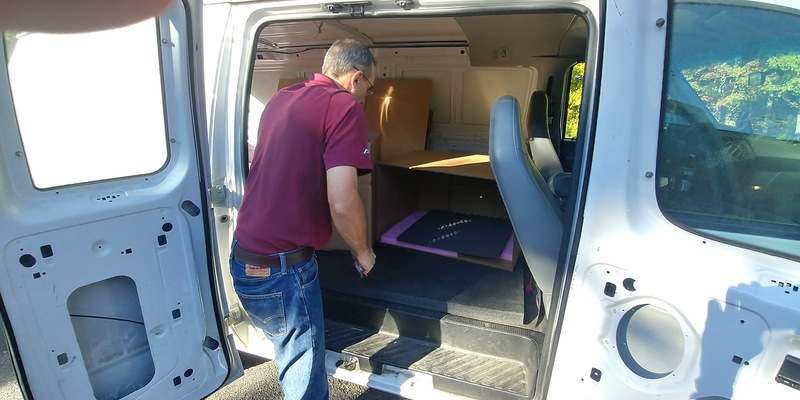 A crew of 6 took 10 days to pack the 10,000 items. When the trucks were loaded one of them could not make it up the hill from the warehouse and I had to call a tow truck to help. Several tons had to be taken off that truck to keep it in the legal weight for the road. When the trucks weighted for the trip they were loaded with more then 30 tons of microcomputer artifacts. 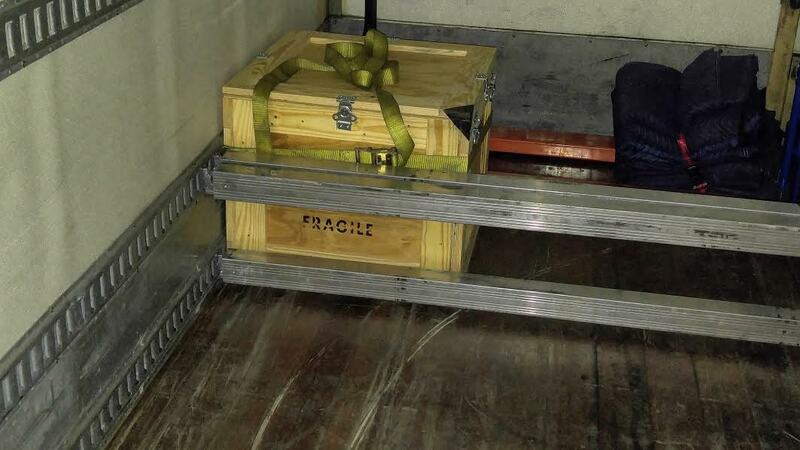 Here is a news story about the shipment and moving the collection. "CLICK"
It is a real pleasure to have the collection now reside with a museum that is growing and can give good visibility our 45 year effort to build the collection. 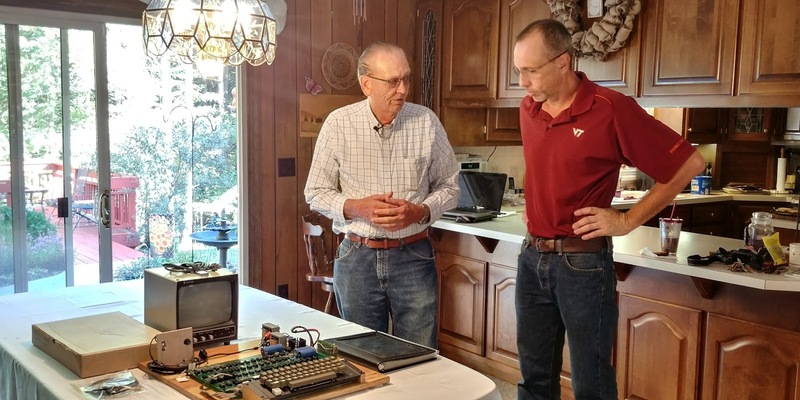 I am not sad to see the computer artifacts leave Floyd, Virginia and look forward to working with Lonnie Mimm's as a board member of his "Computer Museum of America". for delivery to new owner. David Larsen seller of his Schoolsky Apple-1 computer on the left. 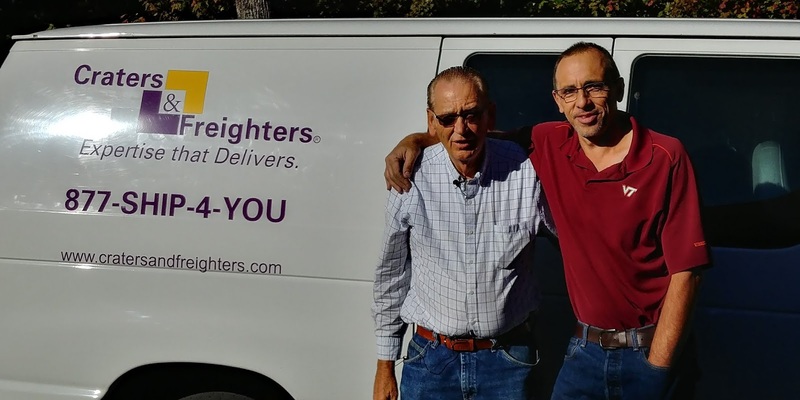 On the right is Paul Puletti of Dynamic Packaging in Richmond Virginia. 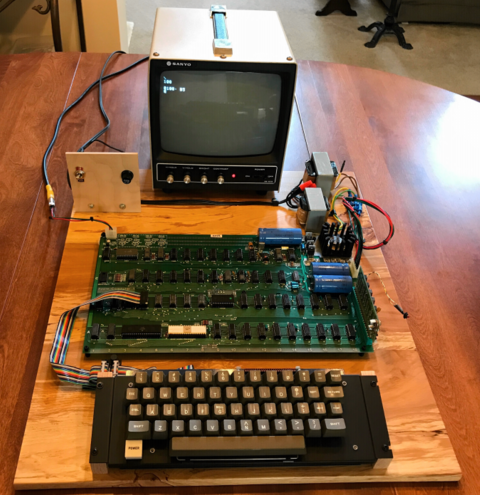 Paul will pick up the compute and take it to Richmond and build the special container to send the Apple-1 on to the new owner by Fedex Critical custom delivery. Assigning the Schoolsky Apple-1 over to the Currier Dynamic Packaging. I signed off on the computer and it is now up to Paul to get it to the new owner. 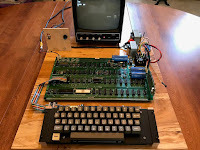 The Apple-1 and the other items are loaded ready to go to Richmond, Virginia. 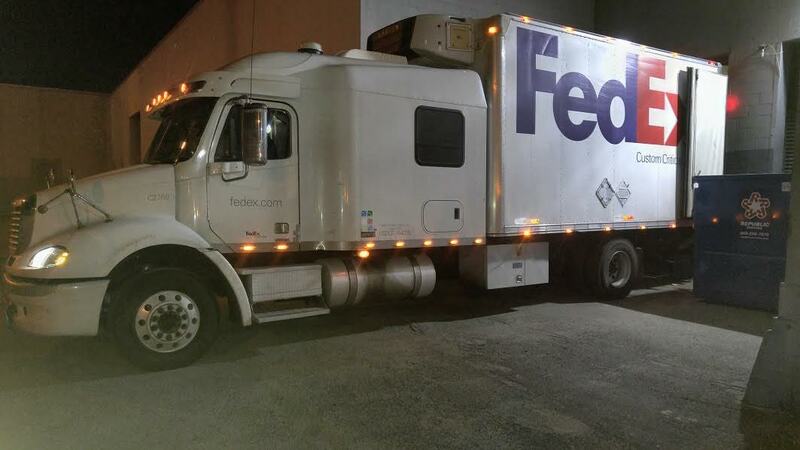 WOW This is the FedEx Critical truck that made the delivery from the Richmond office of Dynamic Packaging in Richmond Virginia to the new owner in NY. FedEx has two drivers for these high value loads. We loaded it at 2:38 AM 10/5/17 and it was delivered to its new home just under 9 hours later at 11:30. The Schoolsky Apple-1 computer as packaged by Dynamic Packaging and is the only cargo in this the truck (shown above). It must have been a little lonely in the back of the truck for the 9 hour trip to NY. 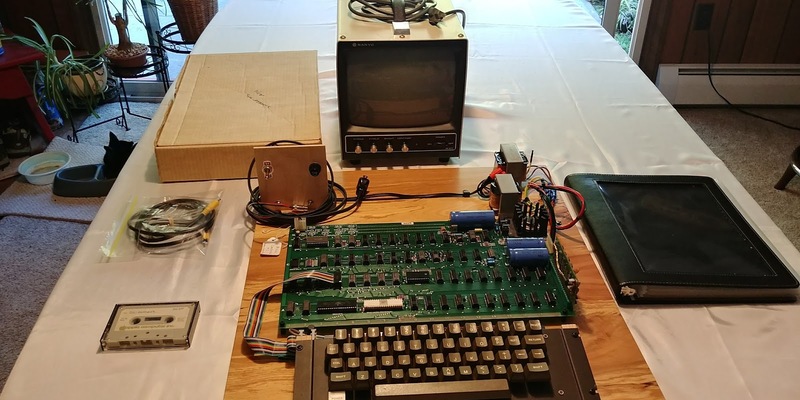 See how the Apple-1 computer was packaged in this wooden container. 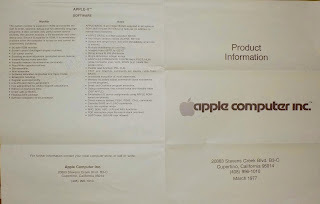 Here is a detailed look at what was included with the Schoolsky Apple-1 computer. The auction started September 12th. I have moved my entire Bugbook Historical Microcomputer collection (All 30 tons) to the "Computer Museum of America" (CMOA) in Roswell, Georgia. I did keep 2 of my original Apple-1 computers and 2 went with the collection to the CMOA. 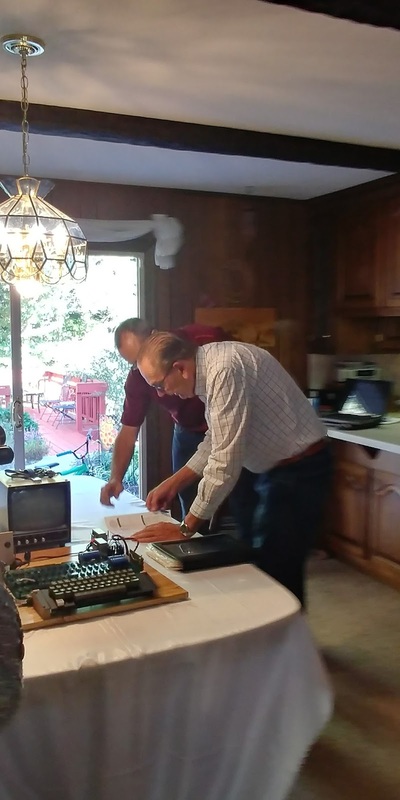 Win Heagy has made the computer fully operational and Corey Cohen did the evaluation of the Schoolsky Apple-1 computer. Part of the proceeds from the sale will go to our "Foundation for Amateur International Radio Service" (FAIRS) N4USA to help continue our international good will work using Amateur Radio. I have been and amateur radio operator (KK4WW) for more than 63 years. I am also one of the directors of FAIRS. 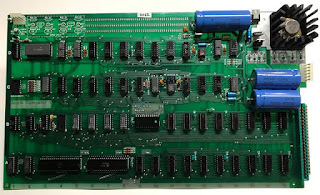 I am continuing my interest in historical microcomputers as a board member of the "Computer Museum of America". Take a look here at the future "Computer Museum of America". 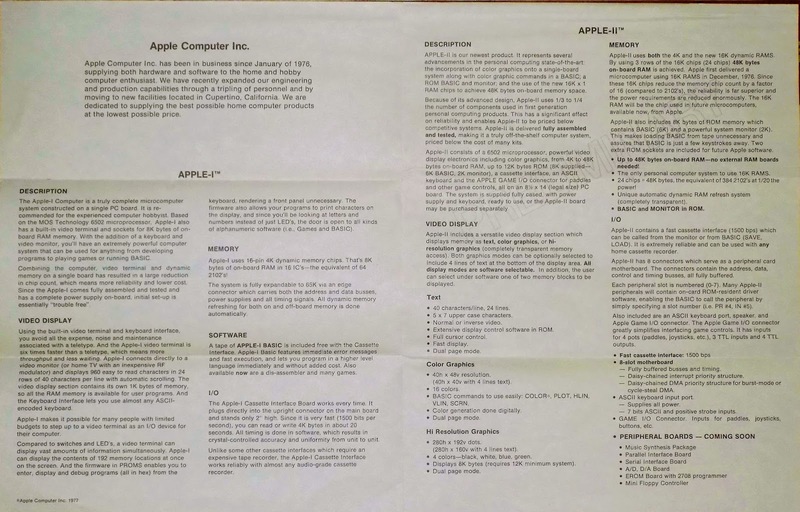 Documentation that is part of the sale of the "Schoolsky Apple-1 computer"
3. #58 on the Willegal Apple-1 registry. 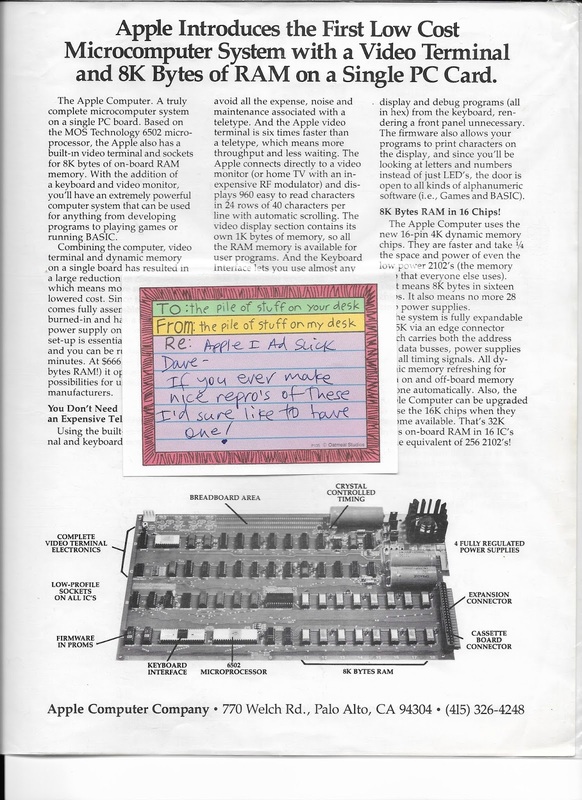 Mike Willegal for many years has been keeping track of all the known Apple-1 computers. All four of the ones I owned are on the registry and the Schoolsky computer is listed. 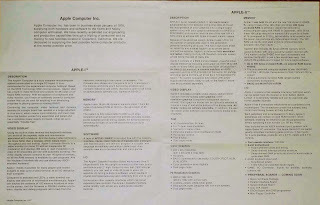 A mint edition of the cassette interface manual is also included -you can see this the evaluation of the "Schoolsky Apple-1 computer" by Corey Cohen. An original 40 page program listing from the first West Coast Computer Faire in California. The Apple Computer Company was selling the Apple-1 computer and introducing the Apple-2 computer at this faire. Adam Schoolsky was also at this show helping the owners Steve Wozniak and Steve Jobs. This is also the Faire where Wozniak and Adam Schoolsky did the Wozniak joke/spoof of putting out a brochure of a computer that was better than all the competition but did not exist. 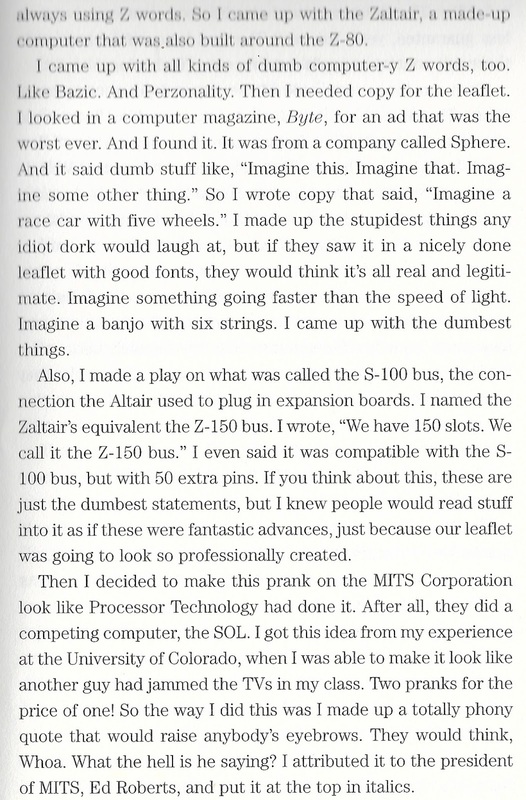 This spoof computer was called the "Zaltair" and now this is referred to as the "Zaltair Story". See PDF view of this entire West Coast Computer Faire program. This PDF is from my copy of the program. Wozniak is a like to pull pranks on people and at 1977 Computer Fair he had Adam Schoolsky help with what is known as the Zaltair prank. The prank worked this way -- a nice 2 sided brochure of a none existence computer ( Zaltair) was made up by Woz and Adam & 10,000 were printed. 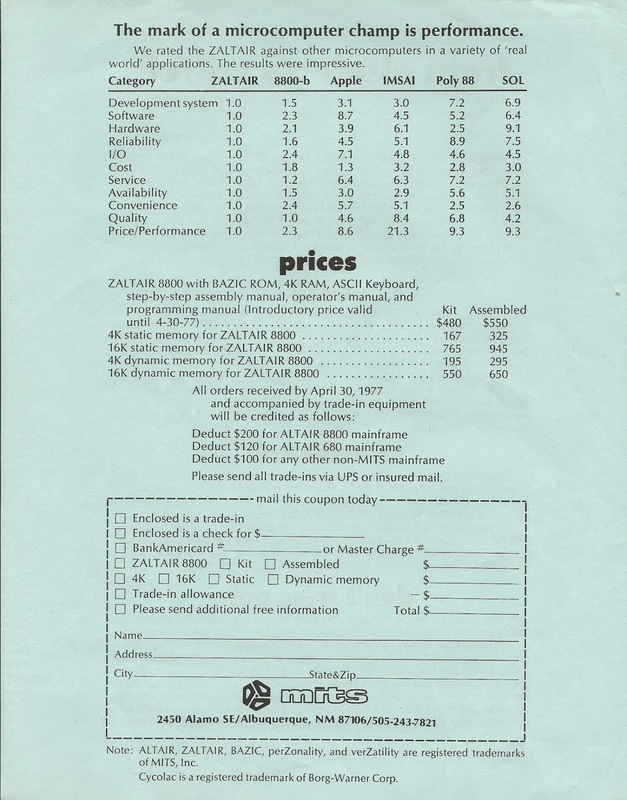 The Zaltair Computer had a better price and specifications then all the current microcomputers on the market. This caused a big commotion at the Faire and it was done in secret so no one new who had created the brochure. It was years later that Wozniak told Steve Jobs that he and Adam did the Zaltair hoax. This is a copy not an original brochure. An original of the very first Silicon Gulch Gazette - volume 0 number 1. 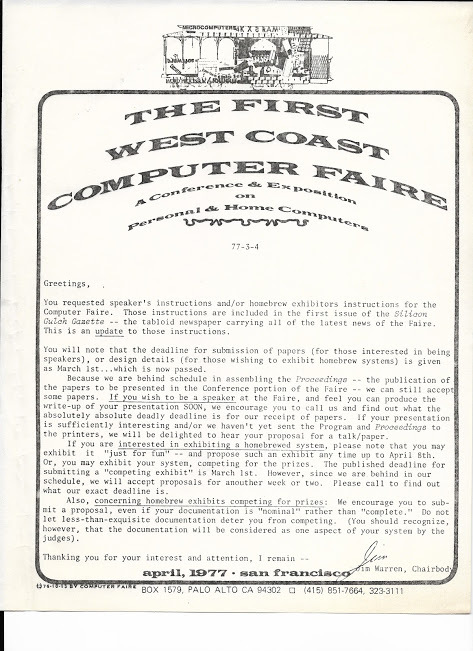 The Silicon Gulch Gazette was published to promote the West Coast Computer Faire. It is interesting that the label was hand written with Adam Schoolskys mailing address. This very first issue is very rare. Jim Warren published the Silcon Gulch Gazette and founded the West Coast Computer Faire. Mr. Warren is still living. This first edition also has a loose leaf insert inviting people to be speakers or exhibitors at the First West Coast Computer Faire. An original of the Silicon Gulch Gazette Volume 4 number 2 addressed to Adam Schoolsky. An original of the Silicon Gulch Gazette Volume 3 number 3 addressed to Adam Schoolsky. Page 250 from Bob Luther's book "The First Apple-1"
Page 256 from Bob Luther's book "The First Apple-1"
Page 266 from Bob Luther's book "The First Apple-1"
Ron Wayne - An original signature. Wayne was one of the three original founders of Apple Computer Business. The business was started on April 1, 1976 and Wayne had 10 %, Steve Jobs 45 % and Steve Wozniak 45%. Only 12 days later the business needed to borrow money and Wayne did not want to be responsible for possible debt and sold out his interest for $800. 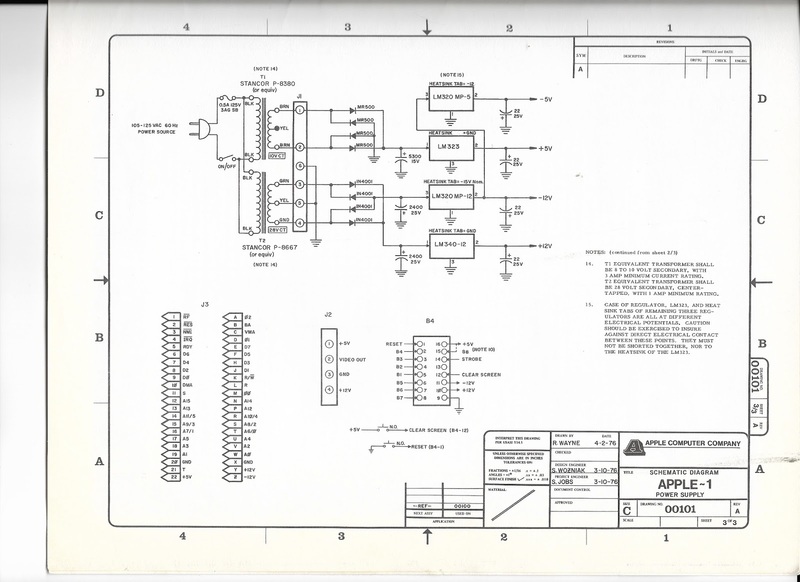 Wayne designed the original Apple logo, wrote the Apple-1 computer manual and drew the Appe-1 schematic diagrams. Very few people know the Apple business started with 3 people. Wayne also did the drawing to the left of Steve Jobs, Ron Wayne and Steve Wozniak. The signature is original however the drawing is a photo copy of the original. 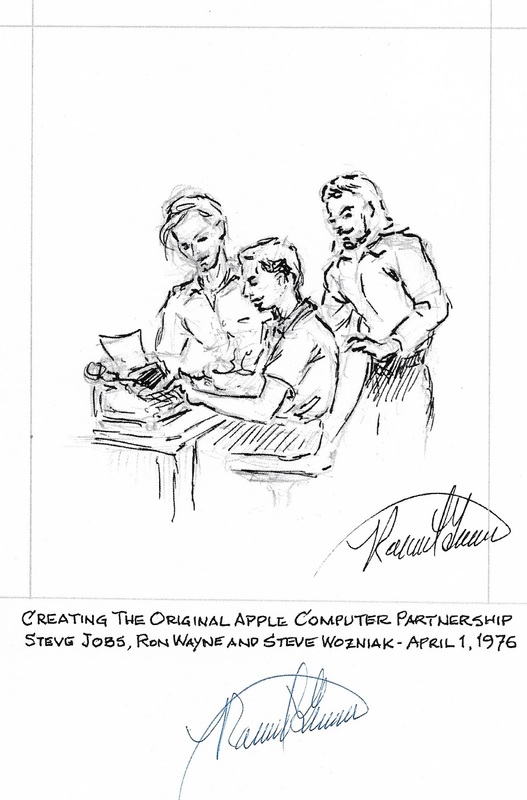 Bob Luther author of the book "the First Apple" had contact with Wayne several years ago and made the arrangements for this drawing with the original signature of Ron Wayne. I obtained this from Bob Luther this year. and the Apple-2 computer. This is an original brochure not a copy. 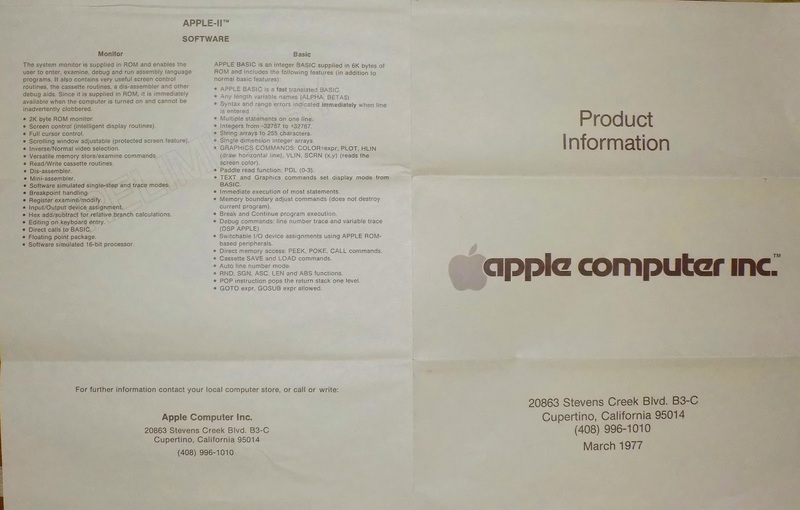 This is an original brochure and most likely the only one made that promoted both the Apple-1 and Apple-2 computer. This is the front/back side. 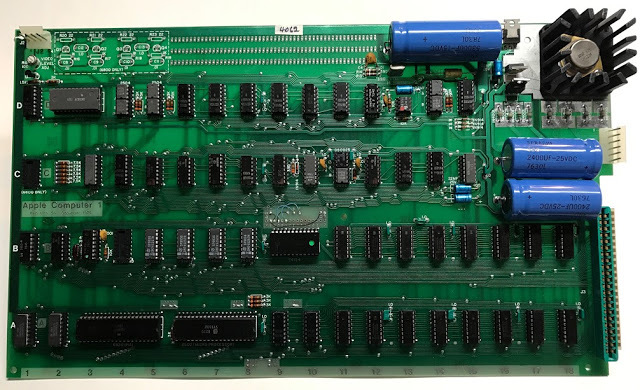 The Apple-1 was on the market for a very short time and when plans for the Apple-2 computer materialized marketing of the Apple-1 ended. To promote the Apple-2 computer na offer was made for Apple-1 computer owners to get a very generous trade in allowance for there Apple-1 computer. This is the inside two pages of the brochure above and the words preliminary are written very lightly on the background of the brochure. 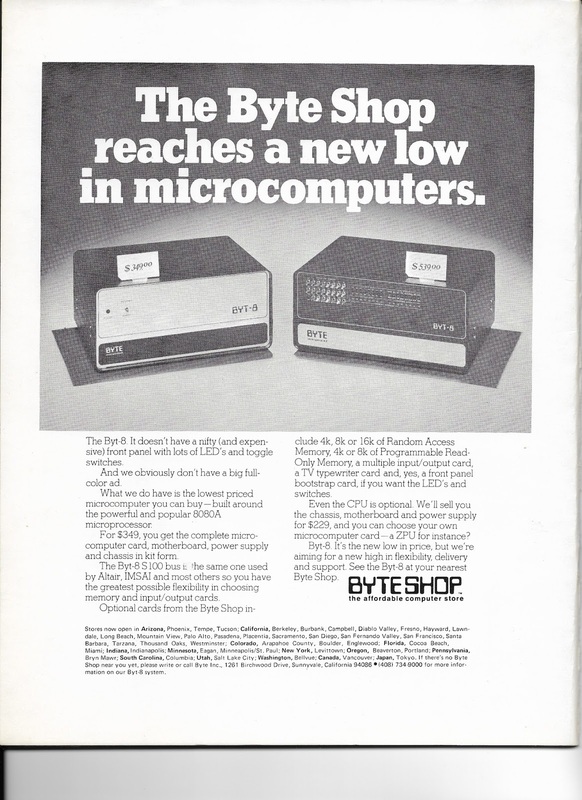 It could be that this brochure was only used at the first "West Coast Computer Faire" in 1977. 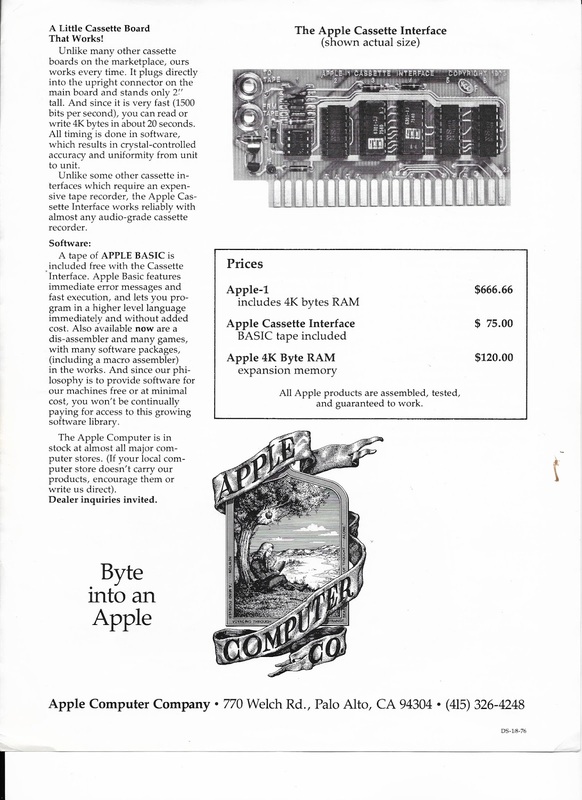 This was the first time marketing the Apple-2 computer. He then dedicated the brochure to the Altair computer made by Ed Roberts. Of course Ed Roberts was highly upset with this fake brochure. Who and how this hoax was done was kept secret for several years. 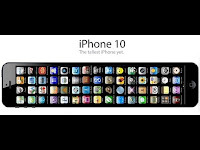 Several years latter Wozniak did tell his partner Steve Jobs that he and Adam did the Zaltair hoax. Press stories showing up on the internet about the auction of the Schoolsky computer. 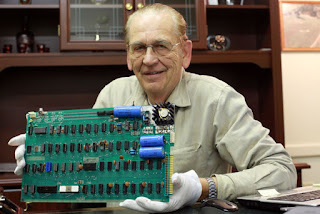 "By David Larsen" KK4WW microcomputer collector and historian.